The CALIFORNIA AIR TOOLS CR-203000-22060 Ultra Quiet & Oil-Free Continuous Air Compressor is designed to be one of the quietest air compressors in the industry having only 67 decibels of sound. 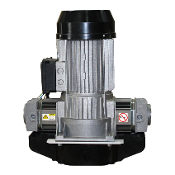 The Powerful "New" 2.0 hp motor operates at only 1680 RPM creating less noise and less wear. The "New" single piston design with dual heads, side on a single axis inside aluminum cylinders that are ceramic coated. The single axis design reduces wear and noise allowing for continuous run times. Up to 8 hours of continous running at 90 PSI and 12 hours at 40 PSI. The Oil-Free Dual Head Piston Pump System with Teflon Coated Piston Rings is engineered for high performance and durability. The CR-203000-22060 Air Compressor has a Oil-Free Piston pump designed to have a life cycle before wear of 3000 hours of usage. The large cooling fan allows for a cooler operation. Designed for people looking for Oil-Free Continous Air Flow with at Least 30% Less Noise!